Sixteen members really, really don’t want Nancy Pelosi to become speaker. They are now on the record: 14 men and two women who really, really don't want Nancy Pelosi to become speaker of the House again. The letter from current and future House members vowing to not back her will not be enough to block her path to the speakership. Though more who share their sentiments didn't sign on, the anti-Pelosi squad is still without a candidate of its own. But if this is a distraction, it's one unlikely to fade even with the swearing-in of the new Congress. The Democratic Party remains locked in internal battles that are ideological as well as attitudinal -- and, as laid bare in current arguments over who should be speaker, often generational. "We promised to change the status quo, and we intend to deliver on that promise," the anti-Pelosi letter-signers wrote, in language vague enough to satisfy any number of agendas. For her part, Pelosi seemed to be signaling an exit strategy when she told the Los Angeles Times last month that she saw herself as a "transitional figure." Notably, though, she's already walking that back. "I think every leader is a transitional figure," she told Robert Draper of The New York Times magazine. Breaking down the math, Democrats have won 232 seats so far -- and in the two races still rated outstanding, according to ABC News projections, the Democratic candidate is up in one and down in the other. Using 232 as the base, Leader Nancy Pelosi could afford to lose 14 incoming Democrats and still get to the magic 218 number she needs to win a majority and the speaker's gavel. Yes, 15 newly elected Democrats signed onto a letter -- 16 people total, but one in a race not yet projected by ABC News -- saying they're committed to voting for new leadership. The signatories were essentially pleading for any other Democrat to run. But that doesn't mean Pelosi is anywhere near sunk. Should no one else emerge to challenge her, and all those signatories simply vote "present" or not vote at all, she would be OK. The group would have to reach about 30 -- closer to the total margin Democrats will have over Republicans -- to change the entire calculus. For the time being, until there is an actual challenger, the story remains: What are Democrats on the fence asking for? Committee assignments? New bills? Legislative action guarantees? The progressive caucus, for example, has been asking for equal representation on powerful committees and there's a tug of war over who will be the next chair of the Democratic Congressional Campaign Committee, too. Through that lens, the speakership fight could still change the agenda come January. 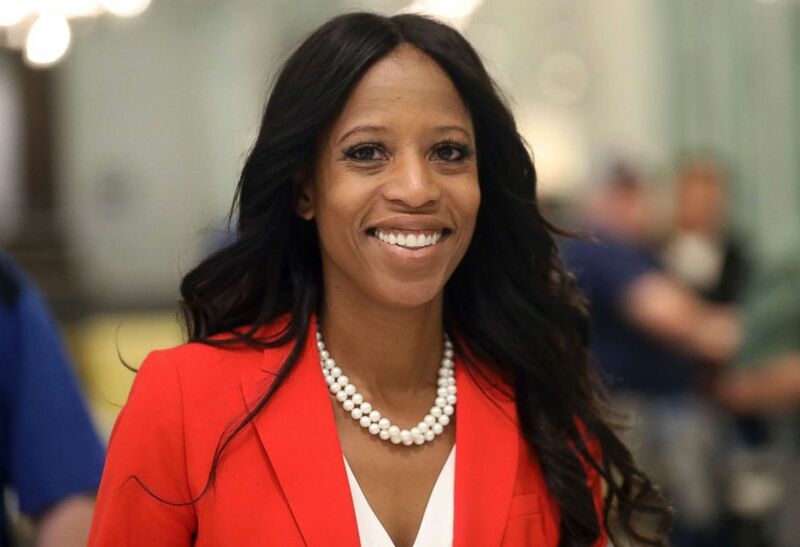 If there's anyone who understands close races, it's Utah congresswoman Mia Love. Love, who lost her first congressional bid in 2012 by just 768 votes, only to win two years later by slightly more than 7,000 votes, has been locked in a tight race for re-election with Democrat Ben McAdams in one of two U.S. House races still not projected by ABC News. (Rick Bowmer/AP) Republican U.S. Rep. Mia Love walks to greets supporters during an election night party, in Lehi, Utah, Nov. 6, 2018. Late Monday night, just hours after Love had taken her first lead of the race, McAdams, aided by post-Election Day votes in Democratic-leaning Salt Lake County, opened up a 739-vote lead. If Democrats are able to defeat Love, one of just three Republican women of color currently serving in the House -- and one of a select group of GOP candidates personally lambasted by President Donald Trump in his post-election news conference -- it would increase the party's net gain this cycle to 38 seats. And while one seat won't shift the balance of power in the House, this race could factor into Nancy Pelosi's bid to be the next speaker. McAdams was one of the 16 Democrats who signed that letter committing to vote against her. Trump pardons one of two turkeys, Peas or Carrots, at 1:05 p.m. in the annual Thanksgiving tradition in the White House Rose Garden. The winner is being chosen in a Twitter poll. In the afternoon, Secretary of Homeland Security Kirstjen Nielsen holds a press availability on border security efforts and the migrant caravan.